The main issue that was argued the last week of January was whether or not a female guard should be permitted to have contact with a detainee. Practical concerns were raised in regards to religion. With Islam, it is taboo to be touched by a female that a man is not related to or married to. Several witnesses were called, including the female guard at issue. Steps were taken to preserve her anonymity and there was no personally identifiable information that was given about her. She testified as to how her job required her to handle the detainee. Arguments were made that went to whether or not allowing females to touch detainees would hinder that females’ advancement in her career, whether or not the defendant’s religious views were being violated, whether or not suitable male replacements could easily be found, etc. I think the real issue, that was never broached, is whether the commission actually has the jurisdiction to rule on this matter with regards to general handling while in custody down at Gitmo. This hinges on how broadly the court interprets the defense’s request for touching to cease. Defense tried to argue for all touching, period, to cease. The judge cannot rule on what happens outside of court related proceedings, and even then, how far does his authority reach? Does it apply to court related medical exams? Transfers from the detention facility to the court holding facilities prior to coming into the court room? Anything further is speculation and a ruling has not been handed down yet by the judge, but I will definitely be interested to see how this comes out. 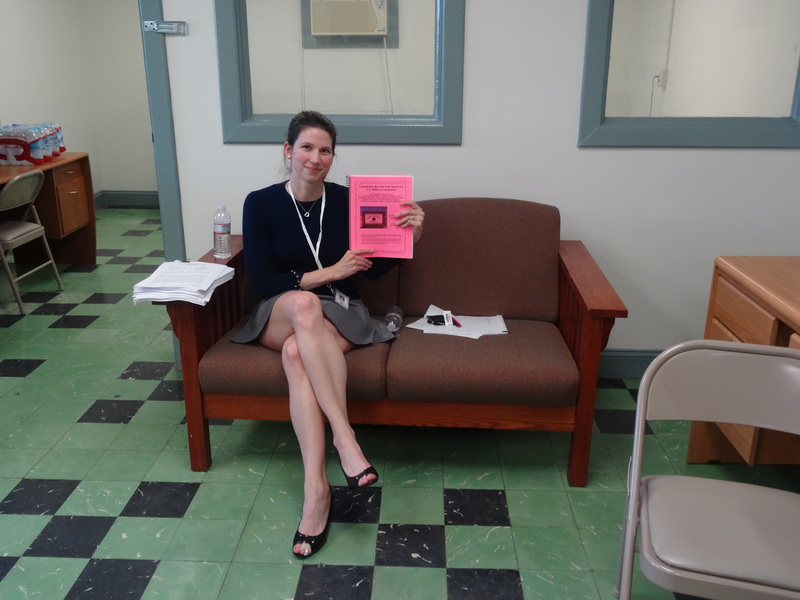 I thought I would comment on how I used the Guantanamo Bay Fair Trial Manual throughout my week at GTMO. Our group was very lucky in that we had more open sessions than other groups have seen in the past. The Manual came in particularly handy when we met with counsel, when I spoke with people outside of the courtroom, educating observers in the gallery, and also while observing the hearings. Colonel Jasper is integral to the defense of the detainees. He is a Marine Judge Advocate and gladly spent an hour speaking to our small group. I wasn’t quite sure what questions to ask him, so I consulted the sections of the manual dealing with “Right to effective Assistance of Counsel”, “Right to Communicate with Counsel of His Own Choosing”, and “Right to Attorney Client Privilege”. These sections helped me to ascertain what questions to ask someone in his position. I can definitely see that he is an effective counsel. He believes very strongly in the rights of his client (Hadi al Iraqi) and was incredibly passionate in his conversation with us. Several of my questions for him came from the manual, which one could not readily ascertain just from observation of the proceedings alone. According to Colonel Jasper, the Government is running all of the proceedings and his client is not getting a fair shake. The prosecution has more resources, he only has four days each month with his client to communicate (and this is when he travels into GTMO), the judge is biased, etc. He does not have the opportunity to really consult with his client in confidence, claiming the government observes, but he does not know to what extent. I did ask him what his level of security clearance is, to confirm that it is the same as that of the prosecution. To me, it still does not make sense that defense counsel cannot see the same documents as the prosecution. In my legal practice, we often encounter documents subject to confidentiality orders that only our counsel can see. They can then advise us on strategy, but not on the contents of the documents. I would think that the defense counsel would at least be afforded this, but apparently everything is on a “need-to-know” basis for everyone involved. I let several observers flip through the manual who were not with our NGO party during the hearings. Unfortunately, the size of it was a bit daunting to some and they looked at the first few pages before just handing it back to me. It was more effective for me to summarize the purpose of the Manual and that I was using it as a guide for my observations. I took lots of notes in it and it was also integral in keeping me awake and paying attention. Sometimes the content of the hearings can get a little dry and it gets a bit difficult to not let the mind wander. It’s also helpful to go back through now that I’m home and I can flip back through it for my notes. Discussing issues prior to the first hearing of the trip on the first day in the NGO Lounge. The manual also served as a good conversation topic with my fellow NGOs. It was a fabulous ice-breaker at Andrews when I handed it out and then we could discuss the contents of it throughout the trip. One example of the topics that came up was that the majority of the questions seemed more biased in favor of the detainees and the defense when we are supposed to be impartial observers. Suggestions were made to pare down the size of the manual, focus more on the questions of law that continually come up among the current proceedings, and provide a shorter version of the manual that refers to the longer version for more detail. 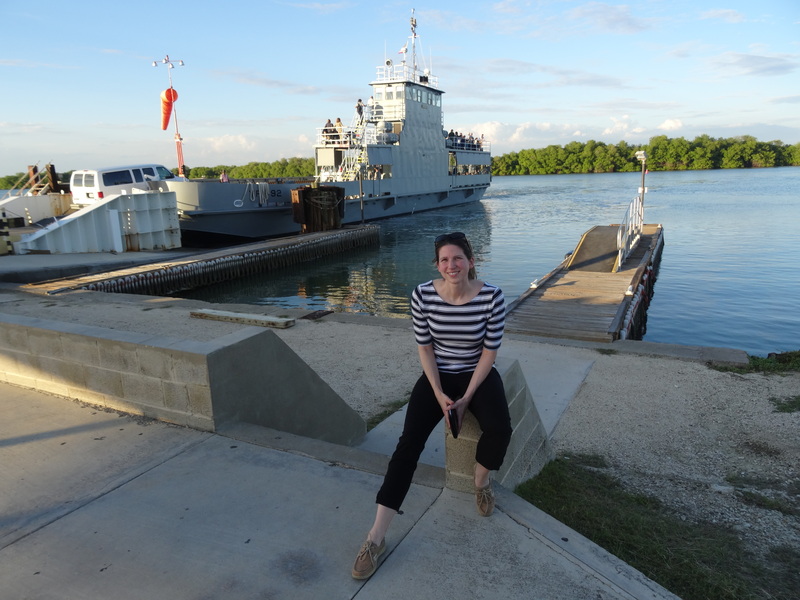 Myself (Margaret Baumgartner) waiting to board the ferry across the base. Now that I’ve made it home from GTMO, I am trying to process everything that I’ve learned. I did not have the time I wanted to sit down and really delve into posts. We were busy with hearings, sit downs, and other interactions, however, I was able to keep a journal. I jotted items down as I went and from these, I will pull my next several posts. One thing I enjoy about travel is meeting new people. If you take the time to really listen, you can garner some fascinating information. We had a picnic table that we NGOs would congregate around at night. Various people involved in the process would join. Others would meet up with us at dinner. The base is very small and thus you start recognizing everyone. There are a lot of people that are very involved in the hearings. On the ferry ride to our quarters at Camp Justice, I spent some time speaking with the three folks who handle the transcripts. They are responsible for making sure that the transcripts of the proceedings are done each day and available to the public on the website. I ran into them again at dinner that night. They have been involved since the beginning and make sure that the public is kept “in the know”. They often work late nights to make sure that the transcripts are available at the end of each day. I also spent some time skipping rocks at a beach with a contractor responsible for the CCTV feed that is sent stateside. He really likes his job, takes pride in it, and is an integral part of making sure those stateside have access to the hearings. Our drivers were really nice and willing to take any of us anywhere we needed to go. One was a fountain of knowledge about the base and he would find out answers if he did not have one. 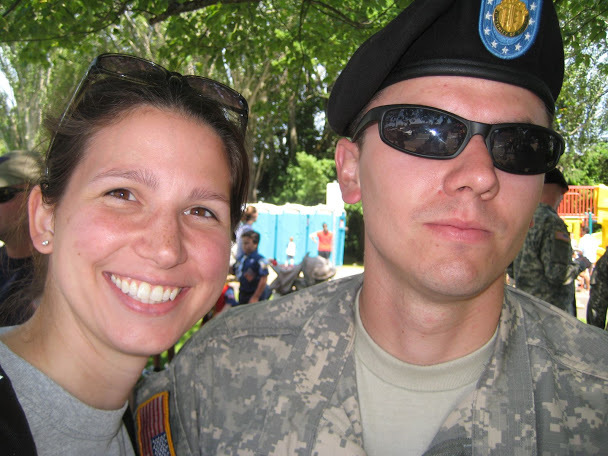 Most of our questions revolved around military life and what it was like to be deployed to GTMO. He also knew a lot about the history of the base. GTMO is more than just a place where detainees are kept. Families of deployed soldiers live there. There are recreational sports. It is like a little town. There’s even McDonalds, Subway, and Taco Bell along with several other places to get out and eat at. 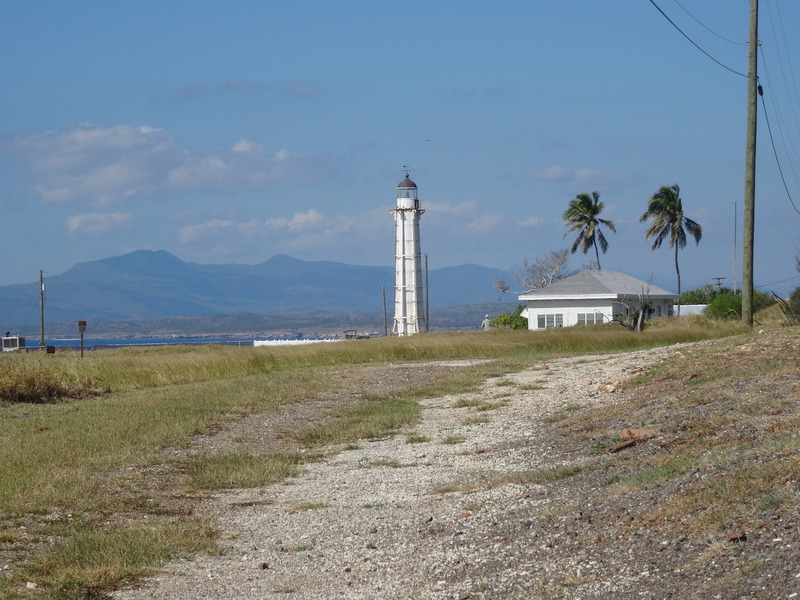 GTMO housed Haitian refugees in the 90s. It was a place where Columbus landed in 1494. Teddy Roosevelt was by the base at one point in the Spanish American War. GTMO is a port for the Navy and the U.S. Coast Guard. Detainees are kept there because no one else wants them, those who do may raise concerns for National Security, and mostly because Congress does not want them stateside. Thus, GTMO has this horrible reputation when it was really one of the few places left to house those accused of terrorist acts while awaiting due process. One person commented to me that the detainees have it better than they (those stationed there) do in regards to living conditions. Would this be made known by the media or others reporting on it? Probably not. It doesn’t make for a good story. The soldiers down at GTMO are someone’s brother, sister, father, mother, and loved one. They are doing what their duty is and it really does sadden me when the collective whole receive a bad reputation for the acts of a few bad apples that are beyond their control. I have noticed that everyone really does the best they can with what they are given and also the situation. Defense, Prosecution, Security, Judge, Staff, Contractors, Deployed Soldiers…..it doesn’t matter who they are, they are all working hard. I definitely gained a lot more respect for those involved in every aspect of the process on this trip. Greetings from the Pearl of the Antilles (Cuba’s nickname). I must admit that I feel quite at home here as GTMO is very similar to most every other military base I’ve been to. The accommodations are reasonable and I hate to admit that I really like galley food. We had a bit of a delay at Andrews AFB, which is fairly normal. There was a lot of standing around and waiting, which is also normal. Our escorts were also on the flight and that gave us a chance to get to know them a bit before landing and for them to be more comfortable around us. I’m lucky in that we seem to a have a nice olio of backgrounds in this small group. There’s myself, a law professor from SMU, law students from Georgetown, UVA, Seton Hall, a D.A. from West Virginia who is heavily involved with criminal rights, and two persons from interest groups. One is Human Rights First. The other one escapes me at the moment, but he is affiliated with the University of Richmond. Four men, four women. One is a Marine Corps Officer who is finishing law school to go JAG. Another wants to focus on National Security after law school graduation. Concerns have been made in the past that the NGOs that do attend are just there to warm seats, without a real connection or interest in the case, or to get a free vacation. I do not see that with this group. All are bright eyed, interested, and I saw many using the hours we were delayed at Andrews to peruse the Guantanamo Bay Fair Trial Manual. It seems that everyone travelling knows each other pretty well (the same people go every time). NGOs receive 14 spots in the gallery, according to one person, so it is a shame that only 8 of us are on this trip. This brings me to my focus of the trip, which will be exploring the issue of Public Access to the hearings. Monday, we had only a half day of hearings before they were classified. The gallery was only about half full of observers. Of those present, about half were in uniform. The gentleman who sat behind me was a member of the U.S. Army. I struck up a conversation with him while we were waiting on proceedings to begin. He did not know much about what he was going to be observing, so I shared my copy of the charge sheet with him. We discussed a lot of it and I also told him about the NGO mission. The hearings on Tuesday were closed and Wednesday is going to be witness examination for the issue of female guards coming into physical contact with devout Muslim detainees. Thursday should be open and Friday will be closed. A lot of what I’ve seen has been that people are not informed. This concern was reiterated by several others that I spoke with. They also wish that civilians were more interested in the proceedings. Access to Fort Meade is fairly easy. One only needs a valid driver’s license and their car registration and insurance to get onto the post. Once they are approved by gate security, the Post Theatre is accessible to observers. Of course, people are not allowed phones or recording devices, but this is the norm throughout civilian courts as well. Concerns can be raised about the lack of public theaters for observation, but conversely, there is not a public outcry for more. Accommodations have been made for the locales of the victim families, such as Fort Devins in Massachusetts, Fort Dix, etc. However, it should be noted that we are in the pre-trial motion phase. For most people, this stage is boring. I think that more accurate observations can be made once the trial phase begins as to whether there is a greater demand for places to observe. 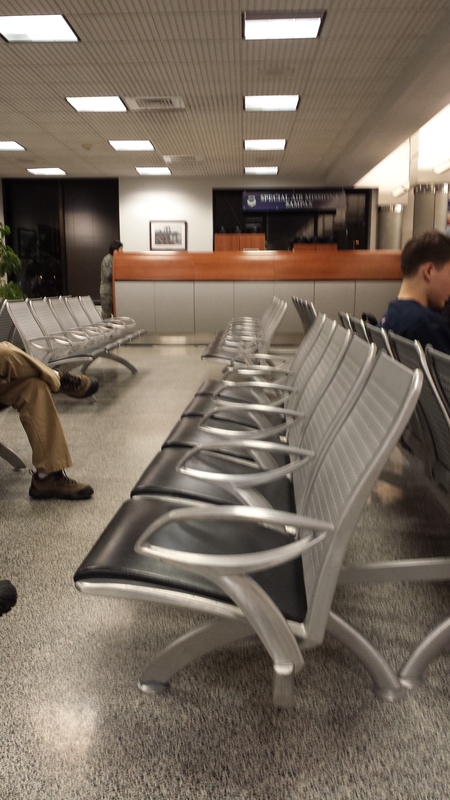 Inside the terminal at Andrews. Getting ready to board the plane. It’s early! I will blog more on that later. Everyone in the group is very talkative and interested in the proceedings. The copies of the Manual were much appreciated that I passed around! I just received my DoD orders via e-mail today. Preparation for this trip has been a whirl-wind. I’m almost done meeting next week’s deadlines for work, since I will be out of the office (I should be careful, they might expect this type of productivity from me on a regular basis!). 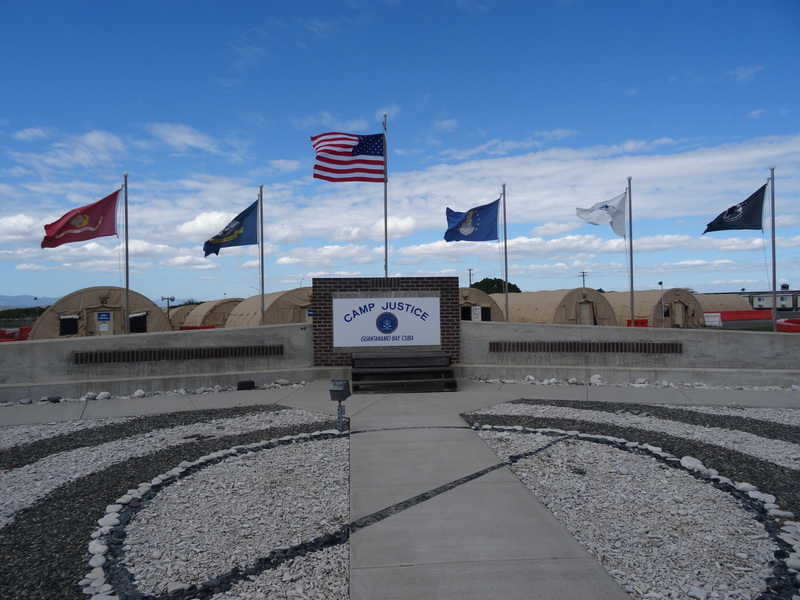 My state-side brother and I were talking logistics and he laughed at me for getting excited about the mess hall. I always have enjoyed the food in the messes and I think it annoyed my brother that I would insist on eating there when I would visit. In his words, the mess hall only has good food when a General visits. It’s a lucky week for me then, since there will be a General in camp! Late night at the office, trying to get through some items in preparation for Sunday’s trip! On Tuesday, I had breakfast with former rep (and fellow 2010 graduate) Hattie Harman. She highly recommended the book “The Terror Courts” by Jess Bravin. I plan to dig into that book before getting down to GTMO as it mentions several people who are involved in the proceedings. I hope this will give me a better sense of who I am talking to when I meet people. The book should also give me some talking points to pass time while we wait in the lines. I have also started my refresher with “the Manual” in preparation and I also went to the GTMO website for information. I am not myself until I’ve had coffee in the morning (see my prior Fort Meade postings describing said addiction), so I was scouring the site for information of a rumored cafe. I will also have my own trusty stash, just in case. On Friday, I will be attending Professor Edwards’ class as a guest to field questions, talk about the project, and meet other participants. That is the extent of my preparation outside of the mandatory paperwork to date, however, that will increase as Sunday approaches. 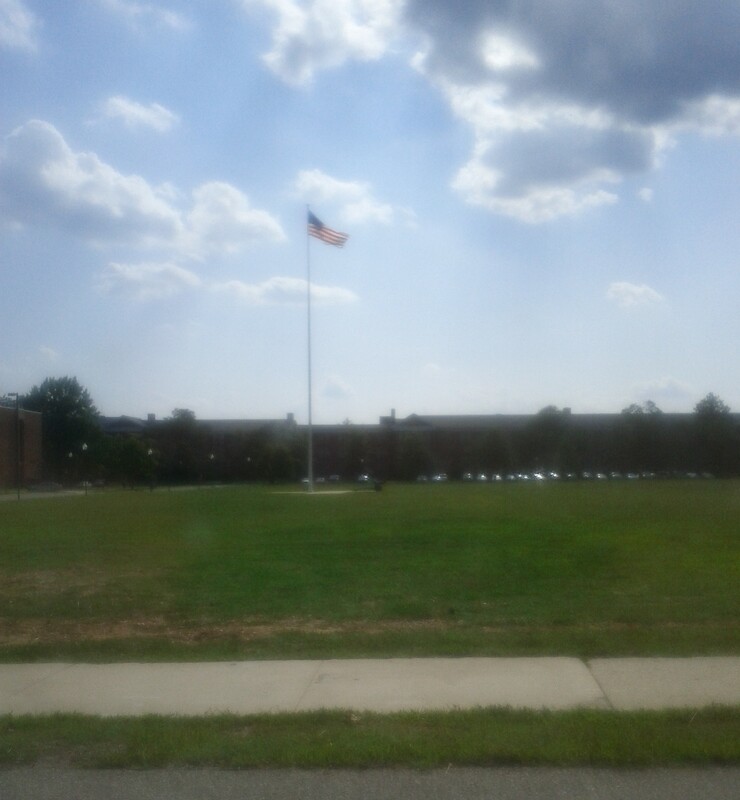 Who Am I & What Did I Experience at Ft. Meade? To put a face behind the name, I thought I’d include a picture of myself. That handsome man beside me is my brother, who is part of the reason I’ve become interested in this project. My other brother is still active duty but I want to preserve some of his anonymity since he is deploying again. Thus, I didn’t include a picture of him (I’m not slighting him!!!). With everything I’ve seen this week, I’ve gone through a wide range of emotions. I wasn’t expecting that to occur. I would walk into the hearing in the morning, feeling that the process in place was a fair one (I do believe in justice) and then I would leave feeling conflicted. Nothing is black and white in this process. For example, I expected the government would be the party slowing the process down to avoid a verdict as they’ve taken this long to bring charges. Instead, it was the defense filing motion after motion and going off on tangents during arguments. I also wasn’t sure what I expected in Mr. Nashiri. From what the contractors said and my observations, he was very respectful (I’ve heard some of the 9-11 defendants are prone to outbursts). There were no outbursts and his responses to questions were polite. I did find it easy to keep an open mind throughout the process and I hope that in my posts, I’ve appeared neutral towards all parties and issues. I have no career experience with international human rights law or criminal procedure. In fact, with my career, I’ve never seen the inside of a court room (patent cases rarely, if ever, go to trial). The only exposure I have to criminal procedure are the courses I took in law school (IU-McKinney School of Law, J.D. ’10) with Professor William Marsh. Professor Marsh would periodically go down to Guantanamo Bay to advise detainees of their rights. He would come back and detail his experience to us in the classroom. This mostly included a trip down and his clients refusing to see him. My interest was piqued by his chronicles (enough that I took two semesters of Criminal Procedure with him!). The materials provided on this website have been a valuable resource to me. Having limited knowledge of this area of law, I found myself able to get quickly up to speed. I specifically like having everything in one place to download. We were also provided with binders containing everything on the website. I liked having the motions, conventions, and histories to flip through as I needed reference during the hearings. If I found anything that might have been lacking, it would be biographies or summaries of the parties on the prosecution and the defense. Another helpful item was a checklist that serves as a guide on what to look for and comment on during our observations. I love lists (I get such joy from checking things off or filling out forms….that’s probably why I’m a patent attorney) and the questions in the list helped acquaint me with the defendant in greater detail. 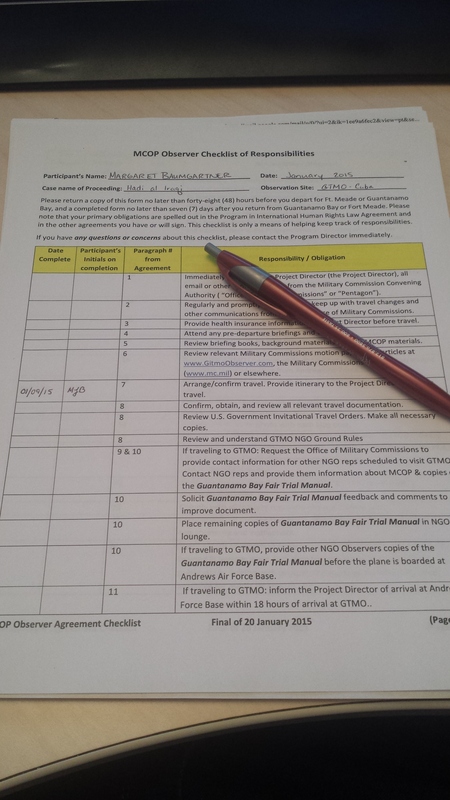 The checklist itself is lengthy and encompasses the entire process. I found myself flipping around to find questions relevant to the pre-trial process, but it was a fantastic resource. Did I witness human rights violations? Is the process fair? There is no definitive answer that can be formulated with three observation days and not having access to ALL (including classified) information. I believe that the length of time that Mr. Nashiri has had to wait to have his day in court would not be stood for if this occurred in a U.S. civilian court. There would be all kinds of uproar in the media. Yet, you don’t see headlines drawing attention to this. I also understand that information that is critical to our national security cannot be revealed, but conversely, defense counsel needs to be able to build an informed case. I feel that this lack of information has contributed to the onslaught of motions and arguments (which is in turn slowing the pace). They are trying everything they can to get something to stick given their limited resources. I’m given the appearance that Mr. Nashiri is being treated with dignity during his detainment. He seemed in good physical health at the trial. He did not appear to be starving or sleep-deprived. He seemed to be accorded his rights to attend proceedings. I was concerned about Mr. Kammen’s comments that they are monitored by video when they meet with Mr. Nashiri. A comment was also made that they thought the room also had audio surveillance. A client has a right to attorney-client privilege and it makes me question if Mr. Nashiri is being given this right. I am satisfied that Mr. Kammen is learned counsel given his experience. He honestly seems to be giving his client his best effort and he appears genuinely concerned for his client. I highly encourage anyone who is qualified to attend as a representative to apply. This program is a necessity to bring awareness to what is going on in Guantanamo Bay. We need to keep an eye on what happens because it will affect how we are viewed by the rest of the international community. Around D.C., there are signs posted in the metro that say “If you see something, say something”. They are for reporting suspicious activity. I think this phrase is pretty apt here as well. Get the word out. Today was a shortened day. Hearings ran until the lunch recess. The hearing after lunch was to be classified and then they would discuss scheduling for the next couple of months. No more hearings are scheduled for this week. Mr. Nashiri declined to be in attendance today. He was present yesterday and on Monday. The defense went through a procedure to demonstrate that Mr. Nashiri’s absence was voluntary, for the record. This included having the staff judge advocate at Gitmo testify of the process whereby the accused was advised of his commissions for the day, advised of his rights, executed a voluntary waiver, used an interpreter, etc. I think it was well established that Mr. Nashiri chose on his own accord to not attend and it was clear from the evidence presented by both parties that it was a voluntary choice. Judge Spath granted the request for 175 more hours of Mr. Assad’s time. From the arguments made yesterday, I feel this is in line with what was presented by both parties (see yesterday’s post for the details and context). Today, I made another effort to speak with those in attendance at the Theatre. It wasn’t a large crowd. 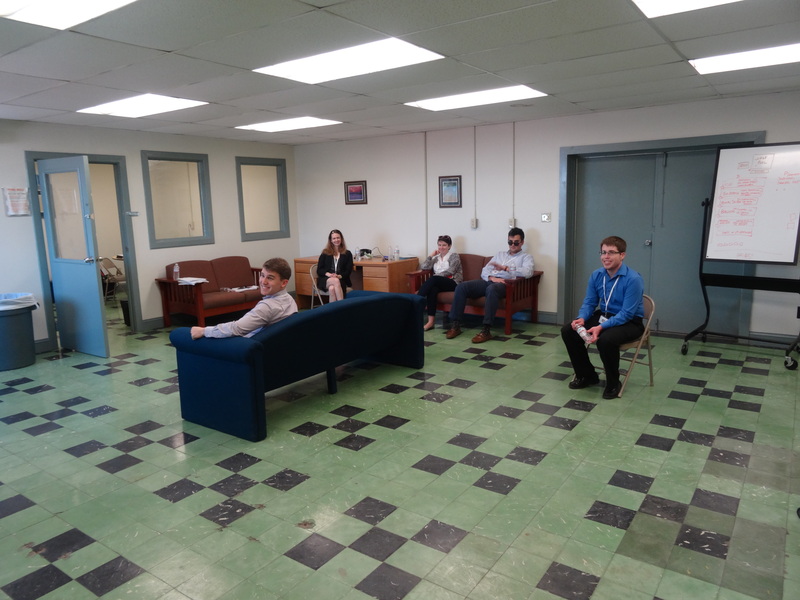 There was one guy who kept to himself (he left at lunch), the lady who polices the door, the two contractors handling the feed, and the wife of one of the prosecuting attorneys. I spent some time talking to the wife and found her very nice. She will be lonely once the trial begins. The attorneys will not be leaving the base until it is over. She did not give many thoughts on the hearings other than they have been going on a long time. Defense filed a motion to compel the procedures on the manner in which the Government intends to put Mr. Nashiri to death if he is found guilty. Judge Spath mentioned that the timing for this motion is a bit early because if the defendant is acquitted, then this becomes moot and there are other pressing matters to attend to. It was really easy to get onto base. Make sure that you veer off to the right at the main gate to the vehicle inspection station if you don’t have a DoD sticker. If you mess up and go straight, they are nice and just send you off a quick side ramp to the inspection station. Allow plenty of time for DC traffic if you are coming from town. It was terrible, even at 6 am. There are a couple of Starbucks within a short drive of the main gate off base. I’m a coffee nut and need my java in the mornings, so of course, I would figure out where the locations are. 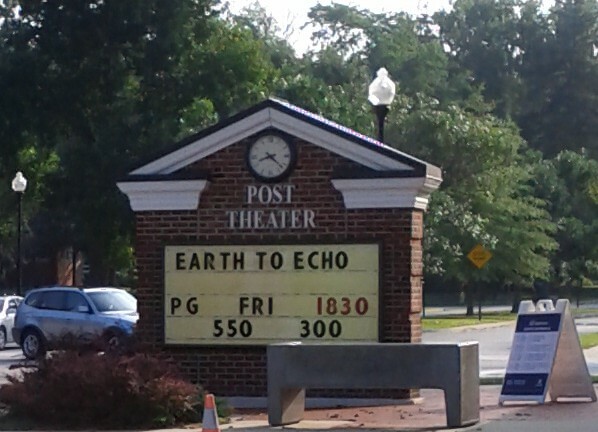 There is parking at the Post Theatre (the Ft. Meade website said to park at Smallwood Hall and walk over, but it’s a distance in heels). I was an hour early. I had plenty of time to talk with the contractors working the Satellite feed. They are really friendly once they were confident I wasn’t a member of the media out to mis-quote them. I’ve noticed similar remarks from people when I tell them what I will be doing next week: “Didn’t that happen years ago?” or “That is still going on?”. I think the same thing as I read through the binder of information and did my own research. My husband, also an attorney by trade, and I discussed a lot of the information as I couldn’t help commenting while reading. Why is it that someone who was captured in 2002, held for four years in secret prisons, charged in 2008 (those were dropped in 2009 when GTMO was SUPPOSED to be closed down), charged again in 2011, is just now getting to pre-trial hearings without release? I skimmed the articles of the Geneva Convention and found myself wondering what we, as a country, are in violation of? Conversely, does the Convention even apply to al-Nashiri as the alleged mastermind of the U.S.S. Cole attacks? Is al-Nashiri a “prisoner of war” (he is referred to as an enemy combatant) as it is meant to be interpreted under the Convention? These are some of the questions I plan to delve further into this week. Selection to attend the hearings for the U.S.S. Cole attacks couldn’t have come at a more fitting time. I just returned from my last in-person visit with my little brother before his deployment. I say little in the fact that he is younger than me, but about twice my size in body mass! He is deploying for Afghanistan with the U.S. Army in a couple of weeks. This will be his second tour of duty in that particular conflict. My other brother has a tour of Afghanistan and a tour of Iraq under his belt (both with the Army as well). I see how these deployments affect my family. My parents have nightmares and are on edge. The worst time was when both were simultaneously deployed to Afghanistan a few years ago. Mom use to have nightmares about my youngest brother’s Black Hawk crashing, him taken prisoner, and she going over to rescue him armed with nothing but a wooden spoon (we tease her about that to this day). Even though I am a Patent Attorney by trade, I have a great personal interest in matters relating to our country’s military and safety. I also believe in fairness. It is a double edged sword for me, but my legal training has taught me that there are two sides to every story. I believe that those on trial for attacks against our country should be accorded due process and fairness – a chance to be heard. If nothing else, it is because I would want the same for my brothers if they were captured and taken prisoner during their deployments. I live in the D.C. area, so I have the luxury of not making travel arrangements. I work in-house at a very understanding and flexible company, which allows me to take part in this more freely than most other employers would. 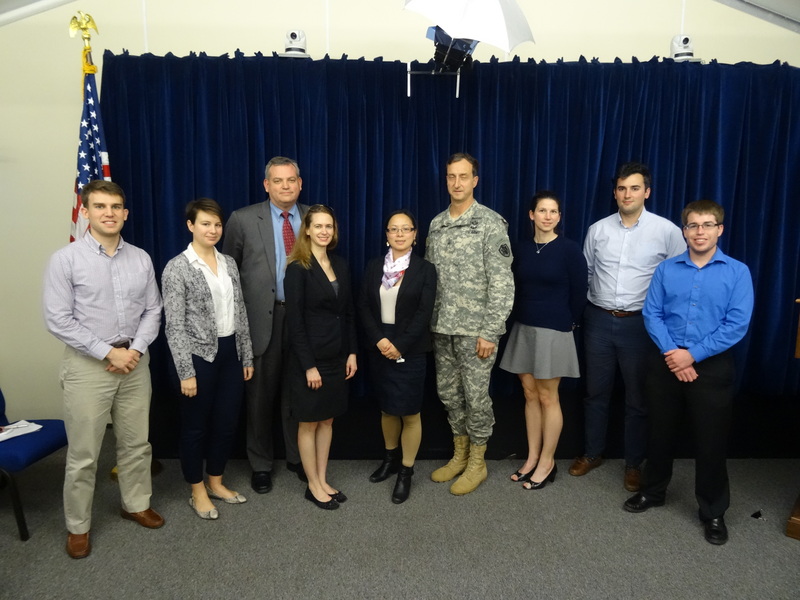 I look forward to attending the hearings next week at Fort Meade and to sharing my experience.